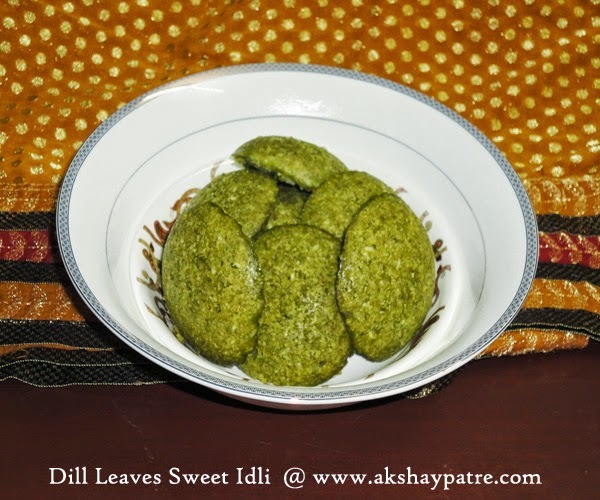 Saipe paanna god idli recipe - This is an authentic dill leaves sweet idli recipe of my hometown. In that part dill leaves are very rarely available and it is seasonal. 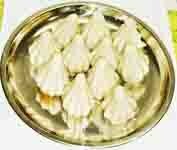 Whenever it was in the vegetable market, we used to bring it and we were making dill leaves idly and dosa. Many people do not like the flavor of this leaves. So, they reject to eat dishes made out of it. But, this is my favorite leafy vegetable and I can eat it in any form. Here we get dill leaves all around the year and I make either idli or dosa with it very often. Being a sweet idli it needs to be served with ghee or butter. Wash and soak the rice for 3 - 4 hours. Drain the water and grind to a coarse paste without adding much water. Transfer to a vessel and set aside. Pluck the dill leaves from the stem. Wash thoroughly and chop. Mix the chopped dill leaves, jaggery and coconut together. Blend them to a smooth paste using little water. Pour this paste in a bowl. Add the semolina and mix well. Add the coarse rice paste and salt. Mix to combine and make a dropping consistency idli batter. Grease the idli mould with oil or ghee and pour the batter using a table spoon. Cook it on medium flame in idli cooker for 20 -25 minutes. Once done, remove the lid and insert a knife and check. If the knife comes out clean, idli is done. Otherwise, cook on low flame for 10 more minutes. Serve dill leaves idli hot with ghee or butter. 1. Wash and soak the rice for 3 - 4 hours. Drain the water and grind to a coarse paste without adding much water. Transfer to a vessel and set aside. 2. Pluck the dill leaves from the stem. Wash thoroughly and chop. Mix the chopped dill leaves, jaggery and coconut together. Blend them to a smooth paste using little water. Pour this paste in a bowl. Add the semolina and mix well. 3. Add the coarse rice paste and salt. Mix to combine and make a dropping consistency idli batter. 4. Grease the idli mould with oil or ghee and pour the batter using a table spoon. Cook it on medium flame in idli cooker for 20 -25 minutes. 5. Once done, remove the lid and insert a knife and check. If the knife comes out clean, idli is done. Otherwise, cook on low flame for 10 more minutes. 6. Serve dill leaves idli hot with ghee or butter. Healthy idlis and looks so soft !